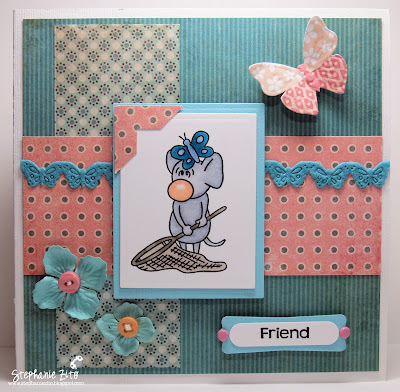 Products used on my card: MME dp, Bazzill and Neenah cs, Kraftin Kimmie Miles Catching Butterflies and Everyday Sentiments stamps, Memento ink, Copic markers, Prima Flowers, Atyou Spica pen, MM butterfly, trim and buttons, DMC floss, SU punch, DB brads, and Nestabilities. Inspiration for my card came from this week's sketch #147 at Friday Sketchers, challenge #71 at Kraftin' Kimmie Stamps Challenge Blog, challenge #49 at Phindy's Place and challenge #49 at Wee Memories. Very sweet. I love Miles and you have done a fabulous job showcasing him. P.S. Check with Debby she has something for you from me! Hi Stephanie. How cute! Love your colour scheme & all your butterflies too. Lovely card. Thanks for joining us at Phindy's Place. This is adorable!!!! !Thanks so much for playing along with us at Wee memories!!!! !